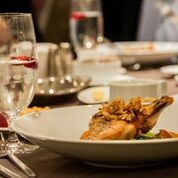 Our luncheon meetings are held on the third Wednesday of the month in Calgary, February to May, and September to December 2019. 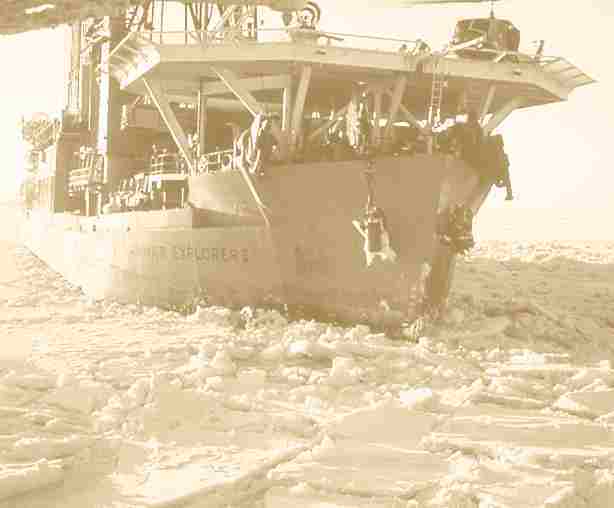 An Arctic Engineer's Story - 1971 to 2006, by Dan Masterson is available for download HERE. Hardcopy of his new book (2019) is available via Cambridge Scholars Publishing. For ICETECH conference archival information, visit www.icetech16.org. Email the ICETECH Secretariat to join our confidential email distribution list and receive updates on future ICETECH activities. 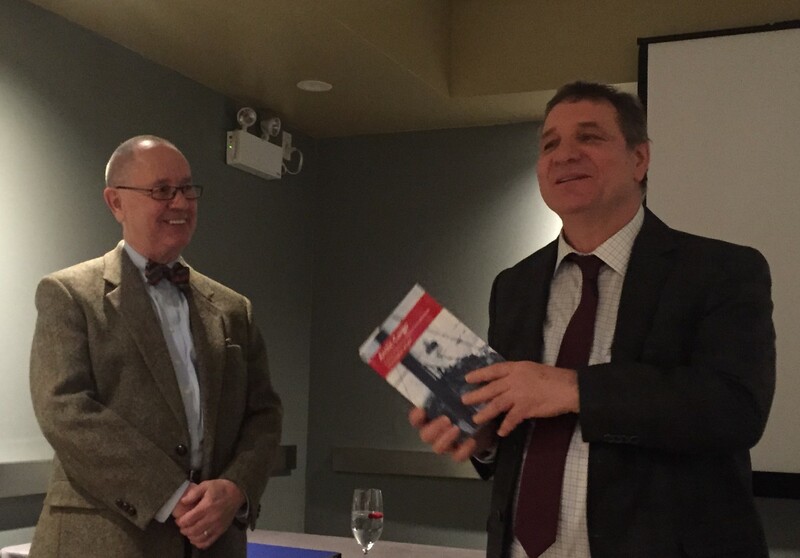 Dr. Dan Masterson introduced his new book, The Story of Arctic Offshore Engineering, an overview of his career and ice engineering over the past 45 years. 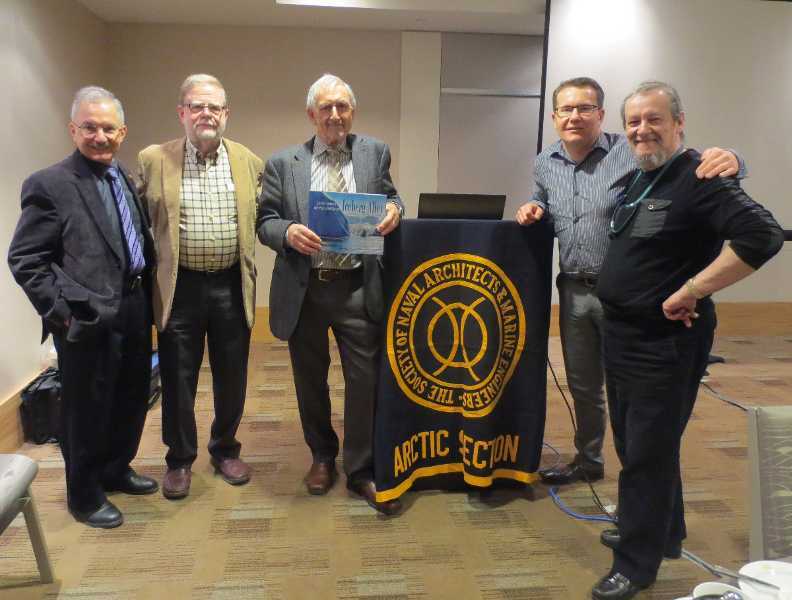 Technical papers, which have been published in journals or presented in conferences by Dan and his colleagues, are brought together in the book in a manner that is of interest to engineers and non-engineers who have a keen interest in the Arctic. Dan also brings his personal experiences forward, presenting anecdotal information of things that happened to him “behind the scenes”, and were interesting aspects of his career. Join us at a future luncheon! Time: Registration 11:30am to noon. 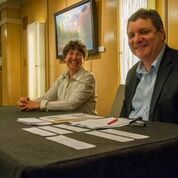 Please contact us if you or a colleague are interested in presenting at a luncheon meeting. Luncheon invitations are sent by email to our contact list in advance of each event. Contact us if you wish to attend or receive information on future Arctic Section events. We maintain our monthly luncheon schedule from September through May, meeting on the third Wednesday of the month. (Our summer break runs June to August). Presentations cover a large variety of topics, including marine, Arctic, logistics, scientific research, ice monitoring, ice management, and more. Program development is still underway for 2019 Luncheon Meetings. Please contact us if you or a colleague are interested in presenting at a luncheon meeting. Luncheon invitations are sent by email to our contact list in advance of each event. Contact us if you wish to attend or receive information on future Arctic Section events. 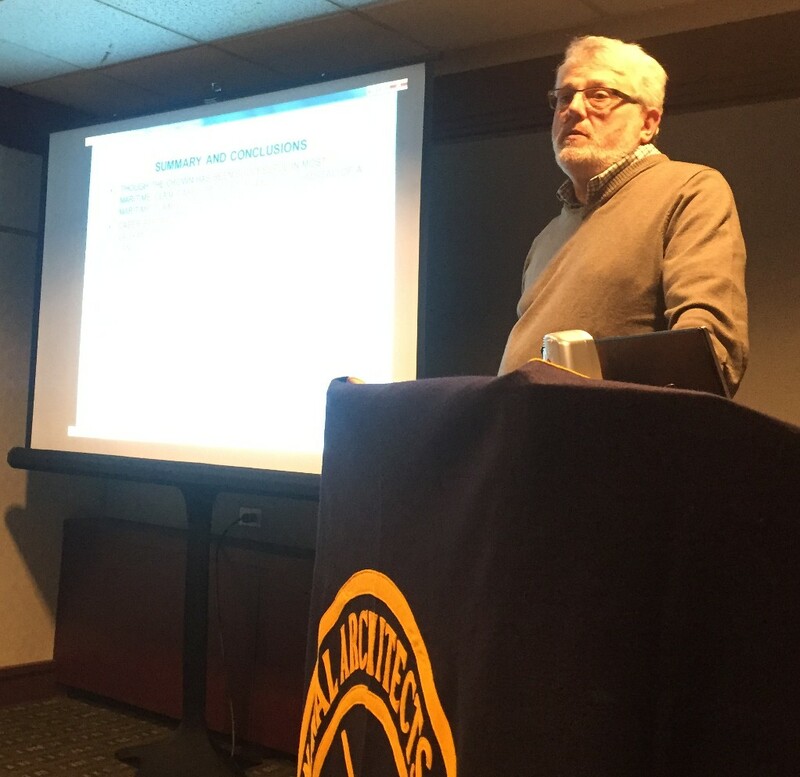 Ken Croasdale, Ice Engineering Consultant, rounded out 2018 with his December 19th presentation The Wanderer of Liverpool and other Tales. 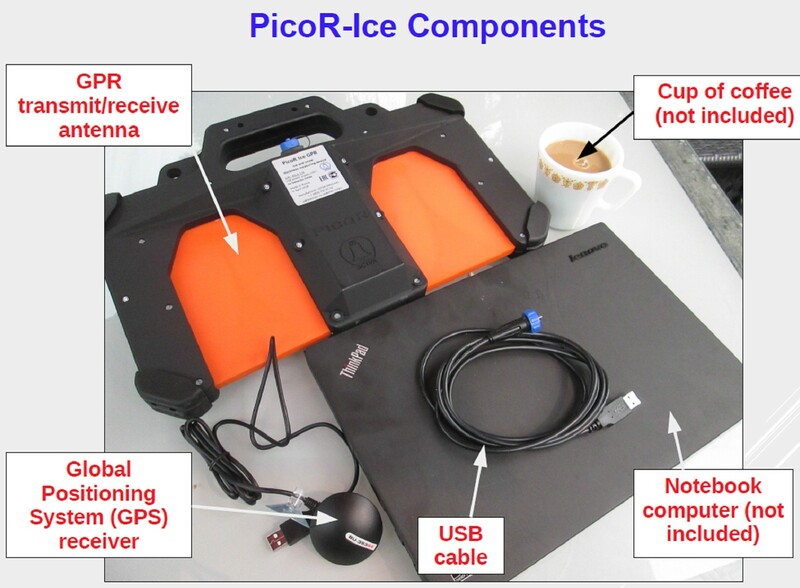 Chris Hill, Canatec Environmental Limited, presented The PicoR-Ice System - Personal GPR for Measuring Ice and Snow Thickness on November 14. 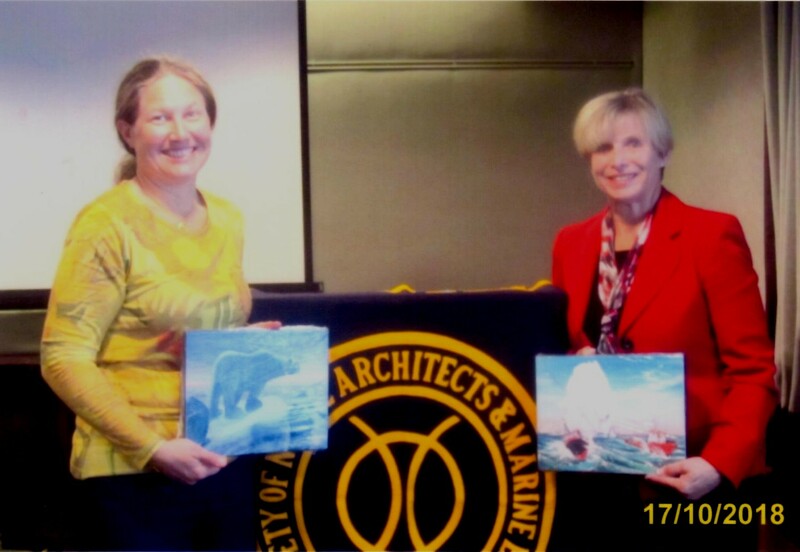 Darlene Seligman of ARKTOS Developments Ltd, presented Amphibious ARKTOS Craft - Unique Capabilities for Arctic Operations on October 17. On May 16, Frank Bercha, Bercha Group, presented Escape, Evacuation, and Rescue (EER) Reliability for Offshore Installations. Kim Clarke and Ryan Robertson of ConocoPhillips Canada presented 2017 Tarsiut Caissons Arctic Decommissioning Project on April 18. 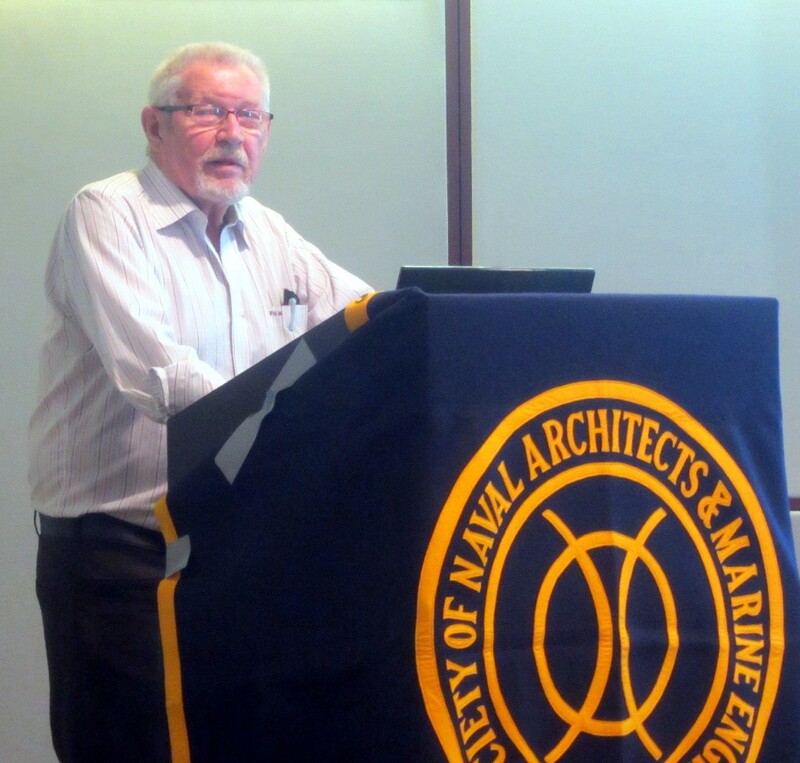 On March 21, Bruce Calderbank, Hydrographic Survey Consultants Intl Ltd, presented Historic Canadian Maritime Legal Cases Involving the Surveyor. 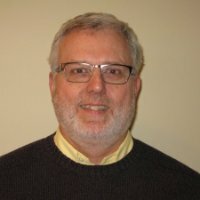 On February 21, Dave Poole of Dillon Consulting, presented Development of a Regional Risk Assessment Methodology for Ship-Source Oil Spills in Canadian Waters. 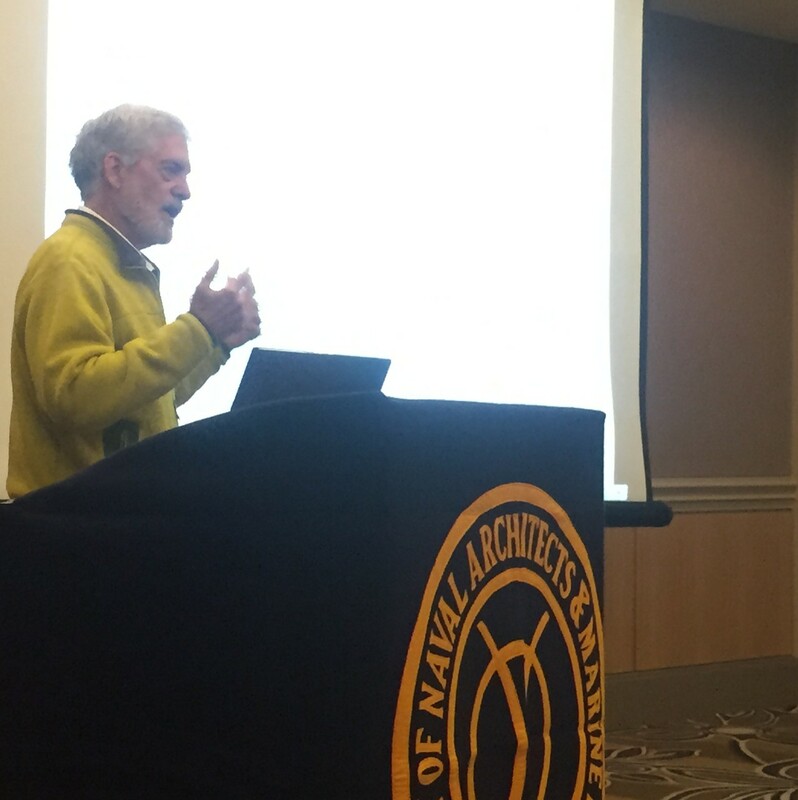 Ice Engineering Consultant, Ken Croasdale started off the new year on January 17, presenting “The best laid plans of mice and men*” – From the blades of propellers to the blades of wind turbines. On November 15, Doug Matthews, Matthews Energy Consulting, presented Is It All Over for Northern Oil and Gas?. Doug is shown here with Dave McGonigal. Scott Tiffin, PhD, Canatec, presented Designing an Arctic Energy Corridor from Alberta through the Northwest Passage at our the October 15 luncheon. On May 17, Bruce Calderbank, FRICS, CLS, PEng, Hydrographic Survey Consultants Intl Ltd, presented Why Did the Clipper Clip It? 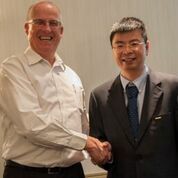 John Fitzpatrick, PEng, CJK Engineering, presented Two Viable Production Platforms in 200m water depth, for NE Greenland at our April 19 luncheon. 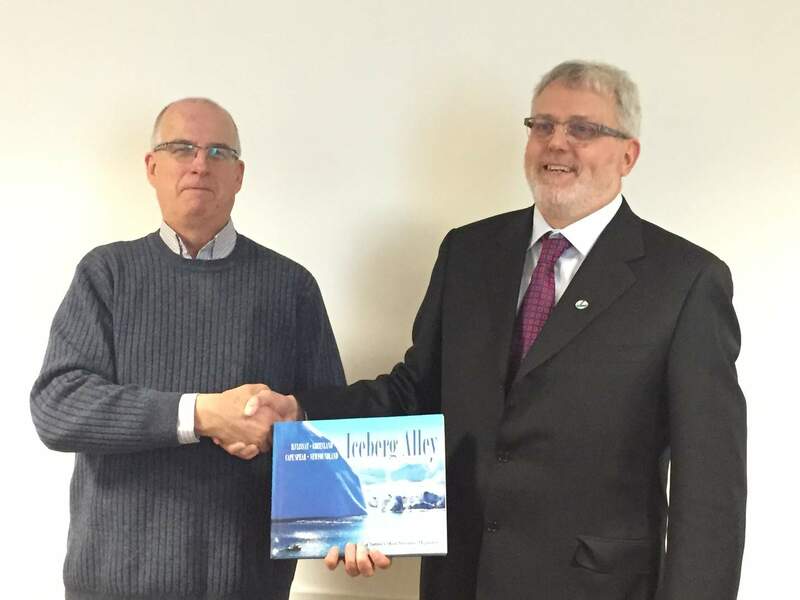 John Fitzpatrick receives the SNAME "icebreaker" thank you gift. John's presentation was supported with images by Jakub Ciring. Visit our archives pages to view this (and other) presentations. 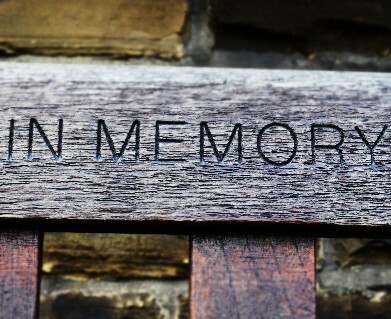 Also on April 19, Roger Pilkington delivered a memorial to Colin Langford who passed away in January. 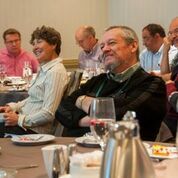 Colin was a long-time member, and in recent years continued to take part in our luncheon meetings. 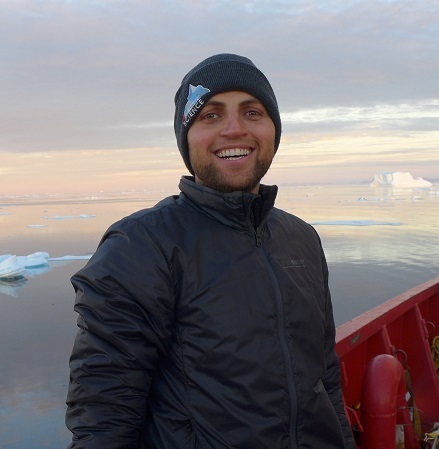 Mohamed Ahmed, PhD student, University of Calgary presented on Estimation of Marine Carbon Sinks and Sources in a Changing Arctic System by Using Geospatial Information Technology. Azmy Aboulazm, Section Chair and Awards Chair, with Mohamed. Our first luncheon of 2017 was held on February 15. 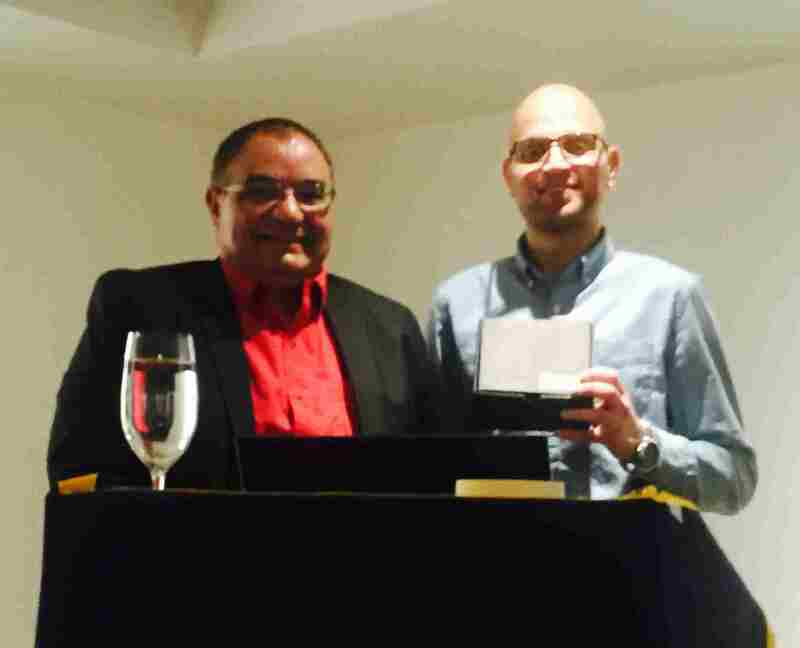 We were pleased to welcome Mohamed Ahmed, a winner of the SNAME Arctic Section’s 2016 John W Davies Memorial Award. Mohamed presented on the research for which the award was conferred. On September 21, Dr. Rob Huebert. Senior Research Fellow, Department of Political Science, University of Calgary, presented on Canada's Arctic Sovereignty. Azmy Aboulazm, Arctic Section Chair, with Dr. Rob Huebert. 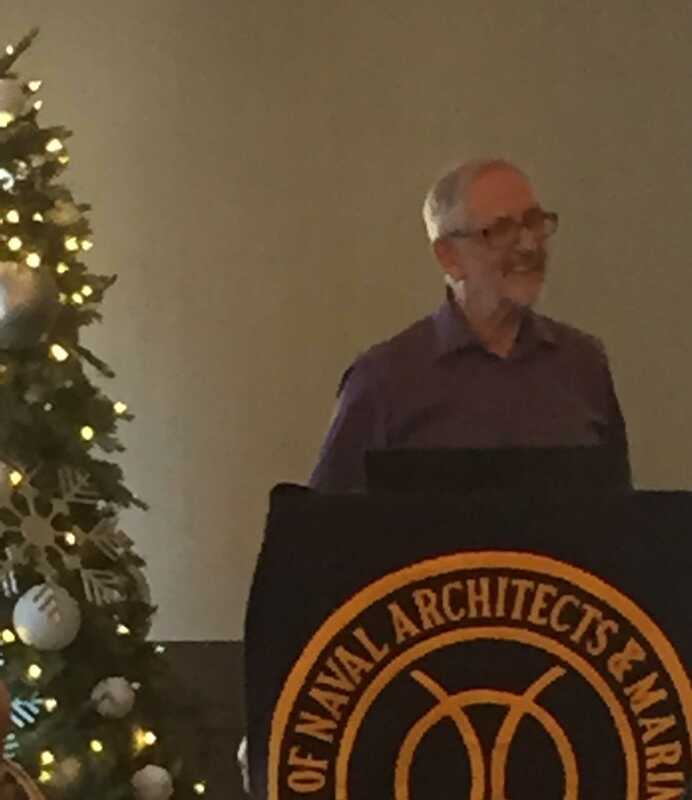 Ken Croasdale, PEng, CEng, FCAE, Ice Engineering Consultant, presented An Arctic Carol: The Arctic Past, The Arctic Present, and The Arctic Yet to Come on December 21. Ken's Dickens-themed presentation was in keeping with the spirit of the season, with Christmas and the holidays around the corner. Thank you Michel Metge for introducing Ken! On February 17, Dr. John Yackel. 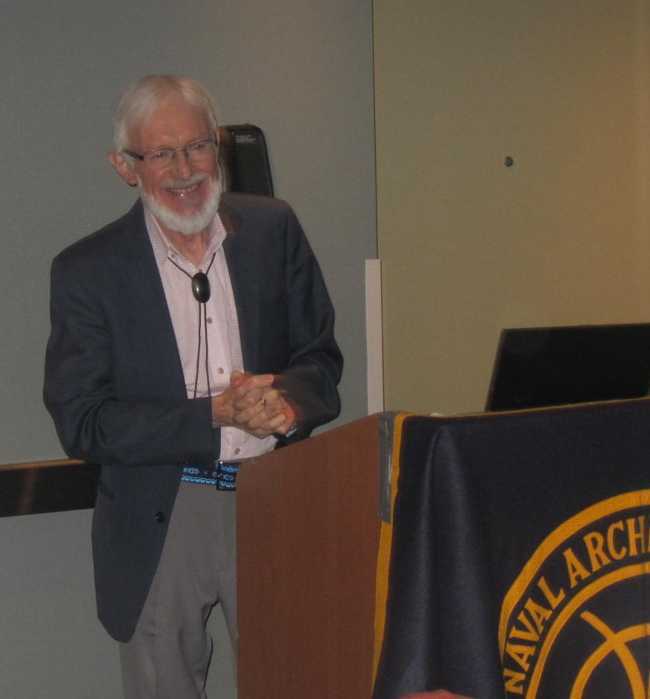 Professor and Head of the Department of Geography, University of Calgary, presented on the Churchill Marine Observatory. 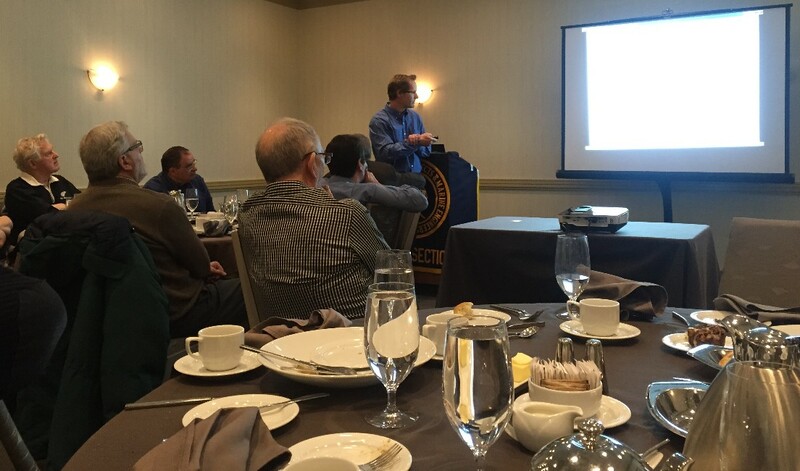 February 17 luncheon, Dr Yackel presenting. The presentations are always interesting... And the food is delicious! 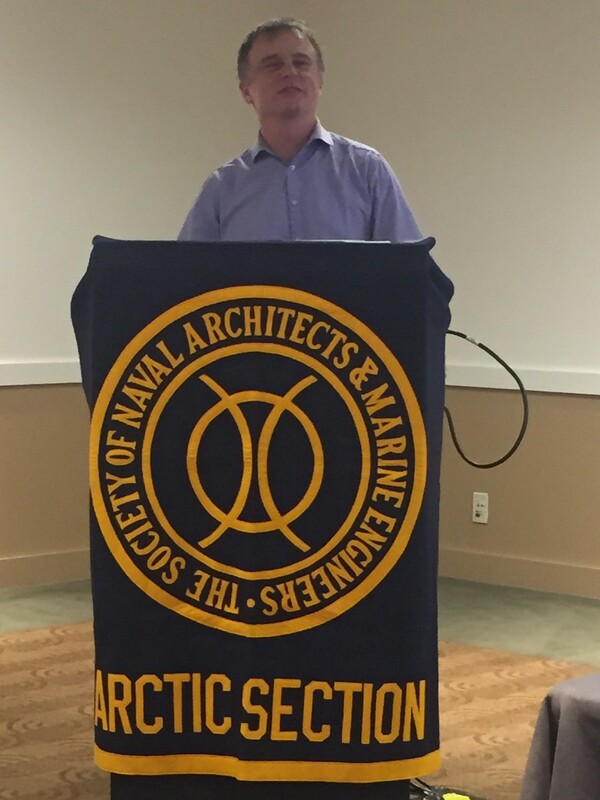 Bruce Calderbank, FRICS, CLS, PEng, Hydrographic Survey Consultants Intl, presented on the Tarsuit Caissons and gave an interesting overview of his Arctic operations experiences. We also celebrated the Christmas and holiday season at this December 16 luncheon meeting. Julia Kennedy-Francis of Kennedy-Francis Consulting presented: A Collaborative Approach to Business Relationship Building in the Offshore Industry at the October 21 luncheon meeting. Our final luncheon meeting before our 2015 summer break was held on Wednesday, May 20 at the Westin Hotel. 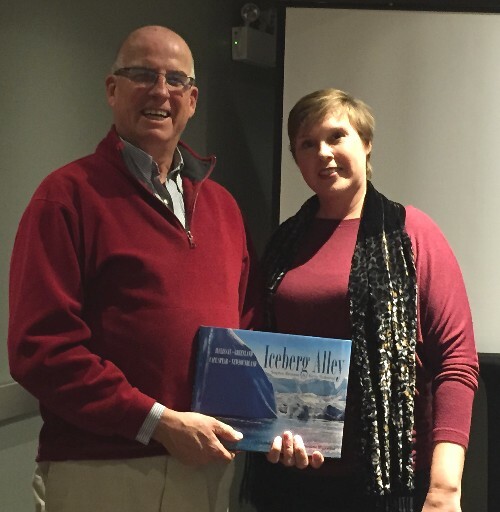 Associate Professor of Physical Geography and Glaciology, and Director of the Glaciology & Geoscience Laboratory) presented: Dutch Whale of a Tale: Arctic navigation, weather and sea ice in 1710. 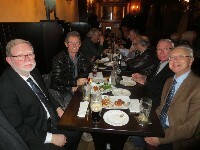 This was also our final luncheon with Alex Brovkin as Speakers Chair. 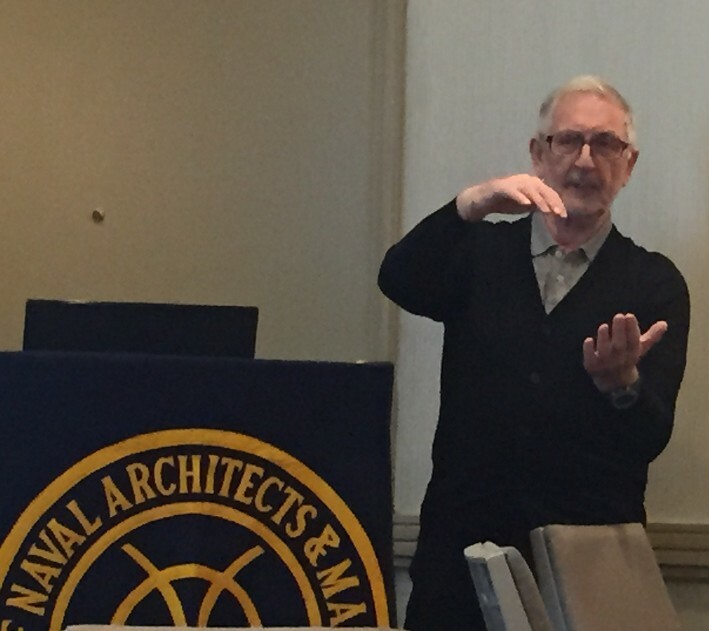 Tom Brown, Professor Emeritus, University of Calgary started off our 2015 luncheon series with his presentation Flexural Failure of Ice: What We Have Learnt on Confederation Bridge. Tom (centre) shown here with Jim Bruce and Alex Brovkin. 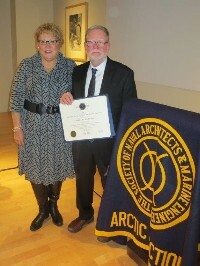 On February 18, Ken Croasdale presented Engineering for Canada's Northern Oceans (a study being conducted under the auspices of the Canadian Academy of Engineering). Ken (centre) is pictured with Waleed Jazrawi and Dan Masterson (left), and Alex Brovkin, and Jakub Ciring (right). 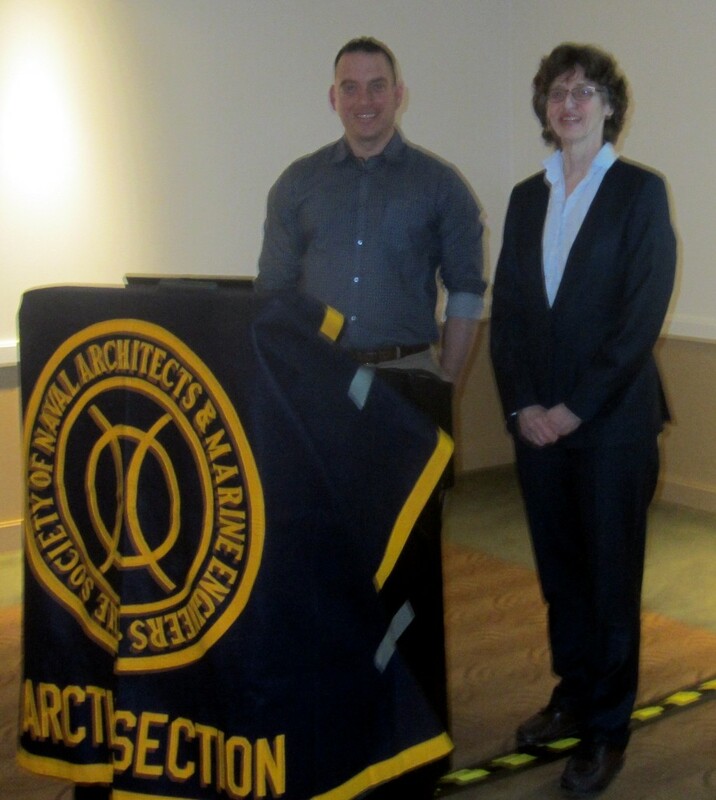 The April 15 luncheon featured Frank Bercha presenting Molikpaq Sakhalin EER Inspection and Analysis. 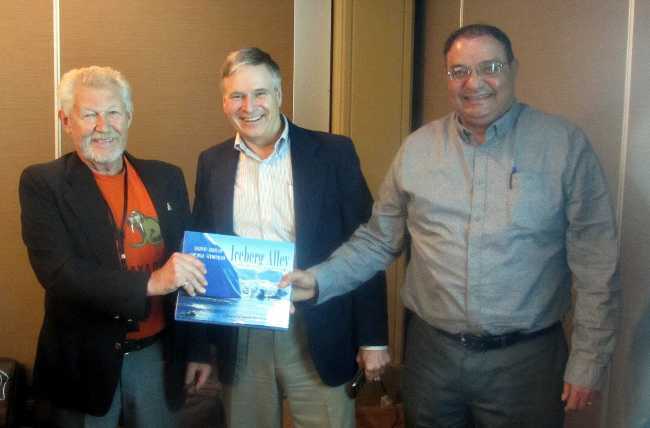 Frank (left) received the Arctic Section's thank you from Merv Edgecombe (centre, past Section Chair), and Azmy Aboulazm (right, current Section Chair). 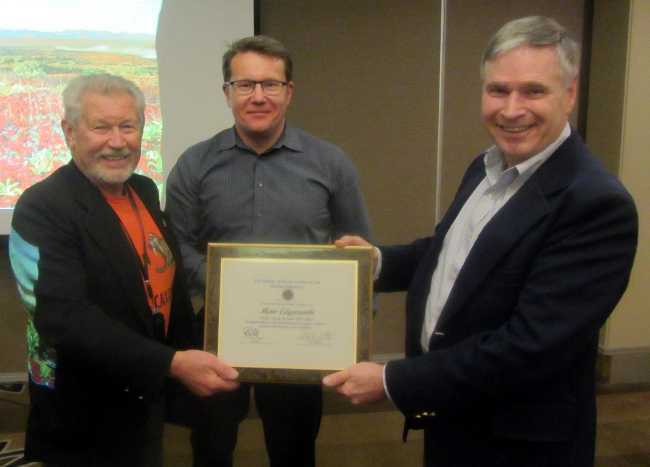 Merv Edgecombe, past Arctic Section Chair, received the official SNAME certificate of appreciation at the April 15 luncheon meeting. 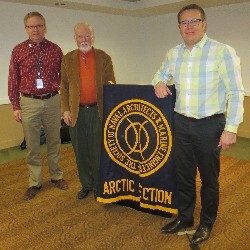 Merv is pictured here with Frank Bercha (left) and Alex Brovkin (centre) who served as the Arctic Section's Luncheon Meeting Coordinator for many years. 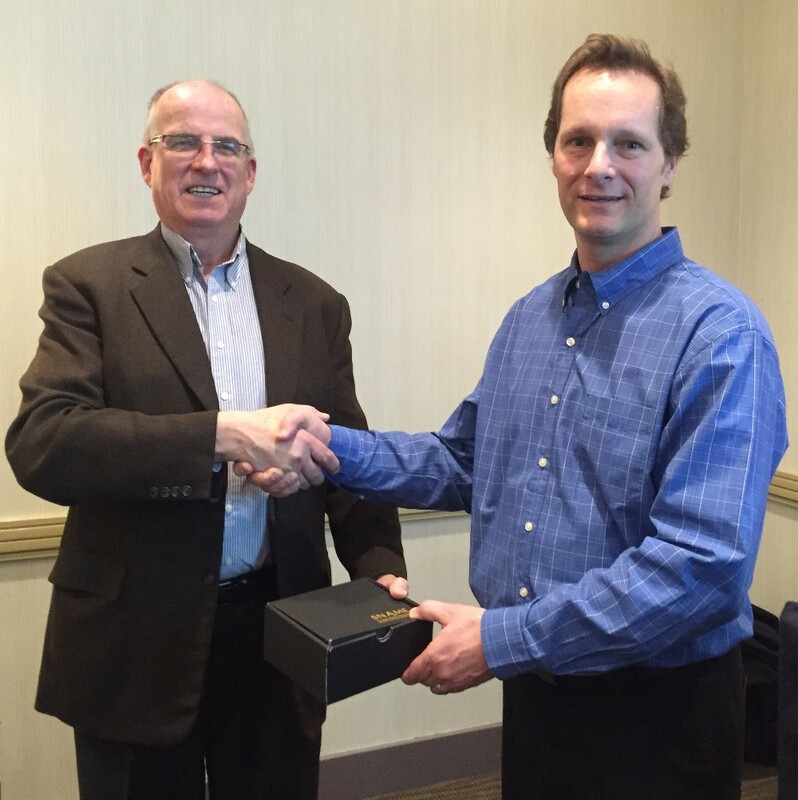 Dan Masterson was inducted as a SNAME Fellow on December 1. Pictured here with his wife, Ginny. Bill Maddock and Peter Noble (SNAME President) with Dan. SNAME is the premier North American society for professionals engaged in ship design, construction and operations. Its Arctic Section is based in Calgary, Alberta, Canada.